Which Flyers Goalie Should Go? It’s everyone’s favorite time of the year, the trade deadline. In fact, it’s the time of year when everyone speculates about the most absurd trades, trading underwhelming players, trading washed up players, and about acquiring players that are out of reach. Of course, there is never any shortage of speculation in Philadelphia. However, what is true, is that the Flyers would be silly not to move one of the two goalies they have under contract. Both Steve Mason and Michal Neuvirth are free agents after the season, and with the Flyers playoff chances dimming by the day, they almost certainly need to move one of them. Both goalies have had less than stellar seasons, but who should the Flyers look at trading? For the larger part of two seasons, Neuvirth has been the unsung backup goalie for the Flyers. That being said, he’s been a very good backup at times for the Flyers. In case you forgot, Neuvirth almost led the Flyers to an improbable comeback against the Washington Capitals in the playoffs last season. After Steve Mason had a string of subpar games, Neuvirth came in and stole two games for the Flyers. He stopped a barrage of shots in Game 6, but the Flyers ultimately fell short. That success hasn’t carried over to this season in the least bit. Neuvirth has a .887 save-percentage and a 2.90 GAA in 24 games this season. That’s a far cry from the .924 save-percentage and a 2.27 GAA. Those stats have sunken even further after a recent string of games in which the goaltender has looked out of it. Dave Hakstol has given the previous nine starts to Neuvirth, but his stats have been atrocious to say the least. In his last five starts, Neuvirth has allowed a whopping 18 goals for a .856 save-percentage and a 3.56 GAA. That includes a lousy performance in the Stadium Series game where he let in two easily stoppable pucks. Would he have any trade value? Probably not, and it’d probably be beneficial for the Flyers to keep him until the end of this season. The harsh reality is that the Flyers probably aren’t going to make the playoffs this season and even if they happen to squeak in, they’re going to have a plethora of trouble trying to even contend with teams like Washington and Pittsburgh. The other side to this is the cap hit. Neuvirth has a relatively low cap hit, at just over $1-million per season. If the Flyers are looking to unload on cap space, Neuvirth won’t really help all that much. There’s also the possibility that the Flyers will want to re-sign him. As crazy as that may sound, he still presents a cheap option in net and if the Flyers are going to turn to one of their goalies waiting in the minors, Neuvirth offers a good veteran presence to guide them along. When push comes to shove, I don’t see the Flyers moving Neuvirth. His trade value is probably fairly low, and he is someone the Flyers may want to keep around, especially if they call up Alex Lyon or Anthony Stolarz before season’s end. The other chapter to the story of the Flyers goaltending is Steve Mason. Like Neuvirth, Mason’s contract also expires at year’s end. However, Mason has a cap hit north of $4-million per year. 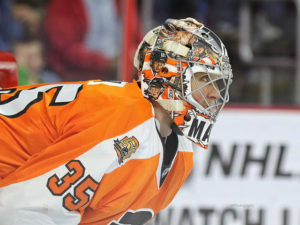 Although Mason has struggled at times, he has been the most consistent goalie that the Flyers have seen in a long time. In the five season’s he’s been here he has a .918 save percentage and a 2.50 GAA. That save percentage is right in line with some of the leagues most prolific goalies in that time period. Keep in mind that was while he was a part of many Flyers teams that struggled in the defensive aspect of the game. 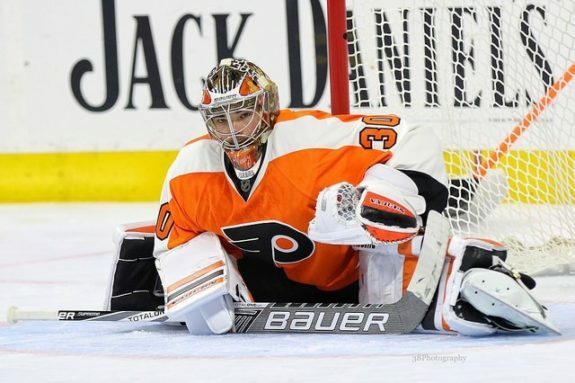 The bottom line is that Mason has been good in his time here and he is without a doubt a starting goalie, but does that mean the Flyers should keep him? Probably not. The Flyers are cash strapped, and Mason is likely going to want a deal that is similar to the one he has now in length and dollar figures. That isn’t something the Flyers can really afford to do. On top of that, as I mentioned above, the Flyers have a very deep prospect pool in goal. Carter Hart and Felix Sandstrom both put on a show in the World Juniors and both made highlight reel saves in a game their countries played against each other. There is also Alex Lyon, who currently sits as one of the best goaltenders in the AHL with a 21-10-3 record, a 2.72 GAA and a .909 save-percentage. Lastly, there’s Anthony Stolarz. Stolarz spent time with the Flyers this season and played exceptionally well in each game he was thrown into. Those prospects might spell the end of Steve Mason’s run in Philadelphia. As I mentioned above, the Flyers have to be smart about how they manage the cap, and re-signing Mason may not be the best fit for that. Trading him before the deadline may be a better option. The Flyers could almost certainly get a significant return for Mason. He’s played well in his time here, he’s still relatively young, and he presents a good option in goal for a team that is looking for a goalie who can keep them in games. In fact, trading away Mason would almost certainly net the Flyers at least a first round pick given the buffet the Lightning got in return for Ben Bishop. It also seems a bit weird that Mason hasn’t gotten the nod in net for a significant amount of time now. Neuvirth has gotten the start in the previous nine games, despite his lackluster play. Given the prospects the Flyers have, their cap problems, and the need to build depth, the Flyers would be best suited to trade away Mason before the deadline, because I can’t see them signing him after this season is over.